So you’ve chosen the perfect holiday destination and have a rough idea of when you want to go. You’re next step is to figure out roughly how much it’s going to cost you and start saving! 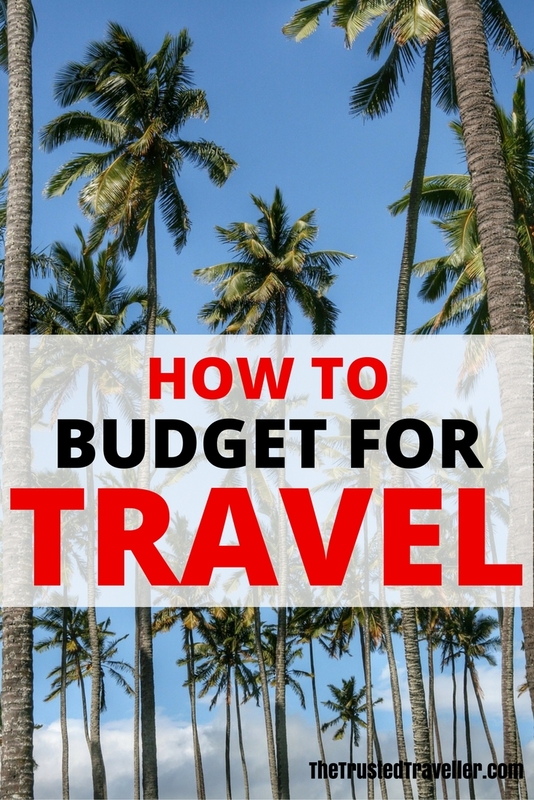 My how to budget for travel guide will help you work out how much money you’ll need for every aspect of your holiday. From the big ticket items like airfares, right down to the change in your pocket to pay for street snacks and subway tickets. I’ll touch on every expense you might have and help make the experience a little less daunting. If you don’t figure out how much this holiday is going to cost you right from the start, you won’t know if you can afford it in the time frame you are hoping for. You don’t want to get your hopes up or put a deposit on an airfare only to discover that you can’t afford to stay in a standard of accommodation you’re hoping too, or that you can’t afford to eat for most of the trip. Having a budget in the initial planning phase stops you from having a massive blowout and spending way more than you originally expected. Your budget is what you will refer to and update regularly through the planning process and having it from the start gives you the bones of the holiday from which you can build on. Start with a simple spreadsheet. It doesn’t have to be anything complicated, just a row for each type of expense and a column each for your budget, actual spend and difference so you can see how you’re tracking over time. I also like to add a notes column to the end of each item so I can make a note of anything important. For example, the row for breakfast, I would type how many breakfasts I’ve budgeted for and at what cost per day. This way if the number of days changes I can quickly change the amount. If you’re not sure where to start, I’ve created a sample budget spreadsheet for you which you can download below. It is complete with formulas that do all the calculations for you. You can add and remove whatever rows are appropriate for your holiday. Once you have your spreadsheet ready to go, you can start researching costs and add them in as you go. You don’t need to make any firm decisions about which suppliers you want to use or what you want to see and do yet. Just take a look around to get a rough idea of cost. Let me break it down for you by going through each type of expense and how you can go about researching it. There are a few types of transport costs you might encounter when booking and while on your holiday. Think airfares, car hire, gas, rail/bus tickets, transfers or public transport. Basically you need to get to your destination somehow. Even if it’s in your own vehicle driving just a few hours away, you will still encounter the cost of gas. Start your research by finding out what types of transport you will need on this holiday. Obviously, if you’re travelling overseas or across a large country or continent you will need to start with airfares. For research purposes, I use websites like Expedia or Skyscanner for this. Input your destination, approximate dates, number of travellers and press search. This will bring up a bunch of different results from different airlines at different times of day, some via other destinations. You don’t need to go into specifics at this stage, just scroll through and average the costs. Again, I use Expedia, so head over there and input your dates, pick up and drop off location(s) and any other specifications you might like including GPS, child seat etc. Like with the airfare search, you will get a bunch of results from different car hire companies and different types of vehicles available. Have a quick think about the size of car you might like and look at the different prices for each car company. Note that there is a price difference between automatic and manual car rentals. Do an average and add this price to your budget. If you’re planning on travelling by rail or bus during your trip you will need to find an average cost for this also. Unlike with airfares and car hire, there isn’t one website that covers the whole world for rail and bus tickets so you’re going to have to do a bit more looking around for this one. I suggest you do an internet search, for example, “rail tickets Europe”. Depending on which country you’re from will depend on the results but usually you will find a reputable website on the first page of results that will provide you with a way to search for rough prices. Once you have an average cost, add it to the spreadsheet. While transfers are generally minor costs, they do eventually add up when combined with the other costs and help to make your budget more accurate. Do an internet search again, this time for the airport you will be transferring to/from. Most major airports will have a section on their website called something like “getting to/from the airport”. Click on that, and it is here that you are likely to find which airport transfer companies operate at this airport and sometimes this page may even have costs on it. If costs are not listed, visit the transfer company’s website to find them out. Add this cost to the spreadsheet and remember to factor in return transfers if needed. Finally public transport. This is going to be the hardest to determine and will depend on where you are travelling to. If you’re headed to a big city then this cost will be higher than if you’re visiting a smaller city or town where you’ll likely get around on foot. Do an internet search for the official public transport website for the city you are visiting. There you will find information on tickets and prices for passes etc. When I visit a big city I usually budget for around two trips on public transport per day. This is something that not all of you will need to think about. If you are planning on going on an organised, multi-day guided tour, then this will be one of your biggest holiday costs. If you haven’t selected a tour company yet, I recommend that you check out Intrepid. I have personally been on a few of their tours and have nothing but great things to say about them. They offer tours to all corners of the world and having something to suit all budgets and comfort levels. Once you have chosen your tour, you’ll be able to see on the tour company’s website how much it will cost. Don’t forget to check the tour dossier for any additional fees like single supplement, entrance fees not included in the tour price or a trip kitty to be paid on arrival. The next biggest expense for your holiday is likely to be your accommodation. There are a number of different accommodation types ranging from top of the range luxury hotels and resorts; modest run of the mill hotels and chains; apartments; budget hotels; B&B’s; hostels; and even free accommodation like coachsurfing. Booking.com – You can find just about every type of accommodation on Booking.com these days including luxury hotels and resorts, hotels in all price ranges, B&B’s and hostels. Couchsurfing – Exactly as the name says, find a couch, usually free, to sleep on in someone’s home. These aren’t always couches and sometime can be a bed or a whole room. Once you’ve done research on one of the above websites, you should be able to find an average price from the options available and then add it to the spreadsheet. If during your holiday you will be staying in more than one location, I suggest having a different row on the spreadsheet for each location to keep a better track of each cost. Some destinations are more expensive than others. This is where a good guide book will come in handy. I always reference my trusty Lonely Planet at this point to get prices for the key attractions in the place I’m visiting. It’s quick and easy and you don’t need to make any firm decisions about what exactly you’re going to see and do, this is just to get an idea of price. How much you plan to spend on sights and activities will be up to you and the destination you are visiting. If you’re spending nights in an all-inclusive resort where you plan to relax and do nothing, then this cost will likely be zero. However, if you’re visiting a big city, say Paris or New York, where a lot of the city’s must see attractions charge an entrance fee, then the costs of these will add up. At this point you also need to think about any half and full day tours you might like to do. I use and recommend GetYourGuide for day trips and tours. They have a wide range of tours in places all over the world and offer something to suit all budgets. Once you have an idea of prices for sights, activities and tours you can determine an average price and add that to the spreadsheet. Working out how much you’re going to spend on food and drink will depend on what type of food experience you want to have. If you love street food, don’t mind cooking your own meals from time to time in the hostel and drinking little or at backpacker bars then your budget will be very low. If, however you’re after fine dining experiences and lavish cocktails in flashy bars with equally flashy views, then your food budget will be high. My food and drink budget is usually somewhere in between. I like to make a simple breakfast in the hostel (when staying in hostels), have a quick simple lunch on the go and finish the day off with a reasonable meal in a nice sit down restaurant. I don’t snack a lot throughout the day but might have an ice cream on a hot day or the odd street snack if I can’t help myself. As an example, for Europe my average daily food budget following the above criteria is around €40 per person. This might seem a lot to budget travellers and too little to those who travel more up market. It is also going to depend on which part of the world you are in. Most of SE Asia will cost you a small fraction of the price of most other regions and countries in the world. Australia is notorious for being expensive for food and parts of Europe and South America are up there too. 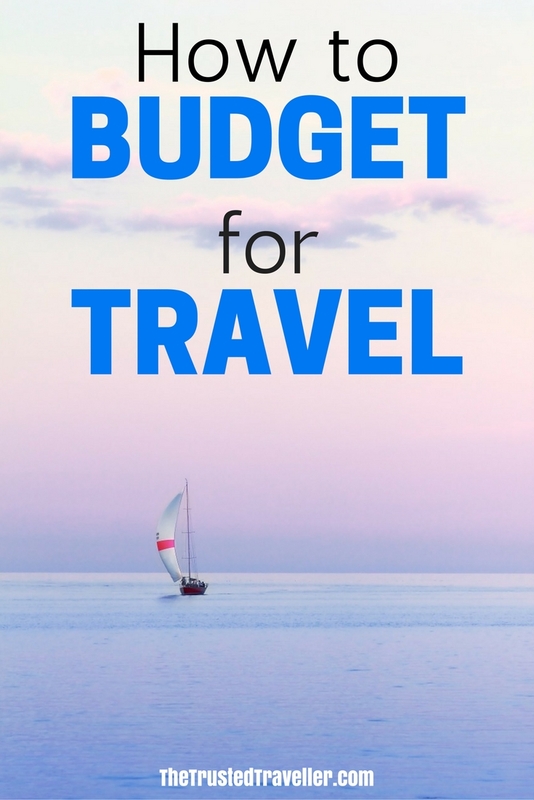 The Budget Your Trip website has estimated costs in three budget levels that should help you figure out how much you’ll need in each of your destinations. Once you have these, add them to the spreadsheet. And remember my earlier tip of using the notes column to mention how many meals you have budgeted for. How much you want to spend on souvenirs and shopping when you travel is entirely up to you. Some people, like me, avoid buying souvenirs and shopping all together because it is extra weight on my back. But for others, shopping is part of the travel experience. If there is something specific that you want to purchase in your destination then do a bit of research about how much it costs. Closer to your trip if you have saved really well and have more than you need to cover the important expenses, then you might like to allow yourself a bit of shopping money. Really, it’s up to you. Just make sure that these expenses make it on your budget at some point before you leave. The biggest major expense you will have in this section is travel insurance. The cost of this is going to depend on where you are travelling to, from and what level of cover you are comfortable with. When travelling overseas I use and recommend World Nomads. They offer different levels of cover with something to suit everyone, cover a large range of destinations and are competitively priced. Purchasing luggage, if this is your first trip, may also be a cost you need to factor in. If you’re after a backpack check out your local adventure stores and for suitcases try a department store. Online research is also a great idea to get an average price. I also highly recommend having a good guide book or eBook with you before and during your travels. I personally love Lonely Planet but there are others that provide similar information for similar prices. 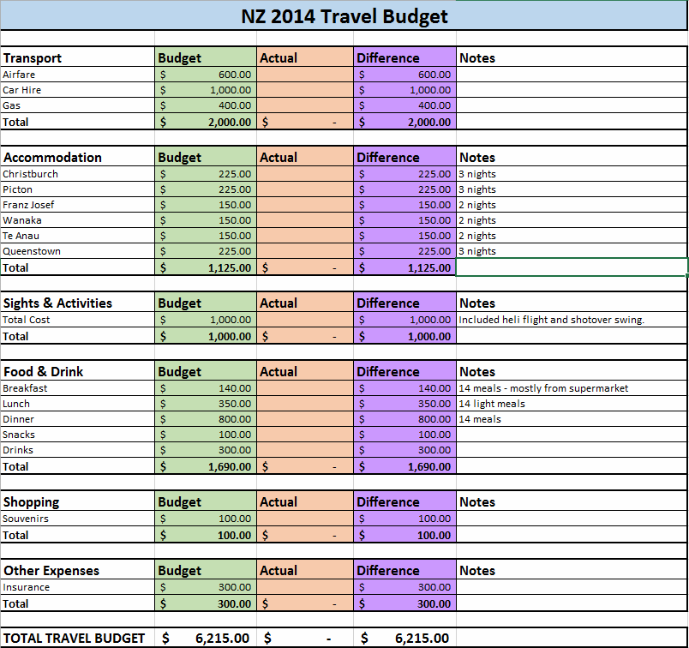 A sample capture of what our travel budget looks like. By now your spreadsheet will be looking very full and you should have an idea of a total average budget. This of course can be tweaked at this stage if you feel it is too high or (very rarely) too low. You’ll have to really think about what is most important to you when you travel. To reduce airfares consider budget airlines or indirect flights. Keep an eye out for sales or use airline miles to cover some of the costs. Forgo adding a GPS to your hire car and instead download offline maps using a good app to your smartphone. Mix it up a bit with your accommodation, especially on a long trip. If you like sleeping in luxury, try adding a few nights in a cheaper form of accommodation like an apartment. Research free activities and events going in your destination and look up museum websites for days they offer free entry. Have a picnic lunch from time to time with food purchased at a local market or supermarket. Not only is this cheaper but it will give you a great insight into the food that the locals eat. If you don’t travel too often, borrow luggage from friends and family to save you the cost of purchasing it yourself. Don’t settle for the cheapest travel insurance policy just because it’s cheaper. Remember that you get what you pay for and that sometimes spending that little bit more will save you in the long run. Now it’s time to start saving! What style of traveller are you? Budget, luxury or somewhere in between? Or does your budget vary from trip to trip like me? Learning how to budget is extremely important! This shows you don’t have to break the bank to have a great travel experience! That is very true Emma. Thanks for stopping by. This is so helpful. Thanks for breaking it down easily. I love the spreadsheet. Planning a big vacation can often seem daunting, but this will sure help for our next big trip. Thanks Gretta! I’m glad this will be of help to you. This is a great, comprehensive list Jen. I like how you’ve covered the various areas for each cost budget of travel such as cost of accommodation etc. I always think it is wise to add in a contingency element. There is always unexpected costs or an emergency. Mind you travel insurance should help if you get a good policy. I also vouch the idea of downloading offline maps to a phone, these are a great innovation. Absolutely, a contingency is very important for those unexpected costs with or without travel insurance. Great post, thanks for being so organized and covering ALL the possible areas of travel costs, especially the sneaky ones like travel insurance. I’m a frequent trip planner myself. Rather than just downloading offline maps, did you know you can look up a map while you have service or wifi on your phone, and then follow yourself on the map via the GPS dot even when you lose service? It doesn’t always work, and you don’t get navigation, but most times you can at least track your location which helps me a ton. Thanks Leslie and thanks too for sharing such a fantastic tip, i’d never thought of doing that. Great breakdown! I think it’s important to figure out a ‘daily budget’ once you’ve saved. So glad I could help Nicole. Feel free to get in touch if you have any questions about your trip. We are always happy to help out where we can. Hope you have an amazing time! Yes, it is possible to travel wisely. Our family of four spent almost 3 weeks in the Dominican Republic earlier this year and paid cash! It was amazing! Thanks for sharing tips on how to plan and budget for vacation. Well done Aja. I think everyone should be like that too!